January 31, 2013 Haze Categories: General News. Comments Off on That yearly MAME summary..
I’ve done an article on MAME / MESS in 2012, covering some of the highlights from my perspective. I added it as a page rather than an update here, so it’s linked on the left or here. Lots of pretty screenshots, most relating to drivers where improvements have been seen, some to help explain points and promote MESS a little. Please leave any comments on the actual page if you have them. 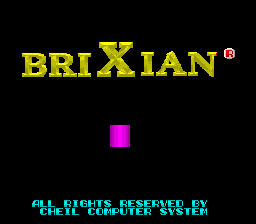 Brixian had been sitting in my todo list for a while, I knew it was an early Semicom game, released under the Cheil name, and was pretty sure the entire protection would involve the MCU copying 0x200 bytes of code to RAM, like all the 68k Semicom titles, even if this one was a Z80 based one running on Arkanoid-like hardware with a 68705 for the MCU instead of the usual 68K + Intel MCU setup. Truth be told I’d simply never got around to doing it, and while Z80 is straightforward enough I’ve never been as fond of writing 8-bit Z80 code as 68k or other 16-bit CPUs. Anyway, it came to my attention that ‘Zabanitu’ who has been assisting with both Grasspin and Planet Probe had a Z80 ‘fluke’ device, a replacement CPU device that can slot in where a Z80 would go on a PCB and give complete control over the system, including pausing the code and viewing / dumping the content of any ROM/RAM areas it can see. There are some caveats of using such a thing, clock speeds being the one of them, but after checking out the Brixian board we guessed it would be possible to use it with said board. Of course such a device makes dumping the 0x200 bytes of RAM I believed the protection MCU uploaded code to very easy. 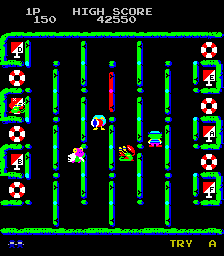 Assuming my original theory was correct then using such a device on the board would make the emulation of the game completely trivial, it would be quicker than writing a trojan then typing in data to find out, and even if the theory was wrong it would give us easier debugging and testing capabilities with the board. 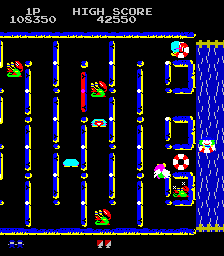 Unsurprisingly it turned out the theory was right, plugging in a simple dump of the main RAM into the MAME driver allowed the game to run through the attract loop in MAME, a few fixes to the input hookups (and disabling the coin lockouts) and I had a playable game. 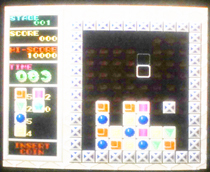 The game as you can see is based on the Puzznic concept, it’s not quite as polished as the Taito original, but the code is an original piece of work, not a bootleg, and as a puzzle game it plays fine. 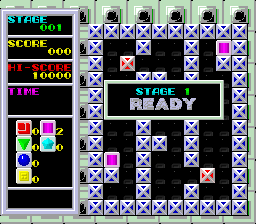 The game gives you a choice of 2 ‘courses’ when you start, but the actual levels also seem randomized to a degree. 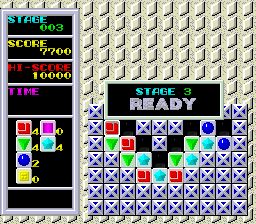 As of 0.148 the MESS binaries are offered as an optional extra to the MAME base package on mamedev.org, while this isn’t a fully merged solution like UME it is a step in the right direction towards having MESS recognized as part of the MAME family, which is one of my goals with UME. 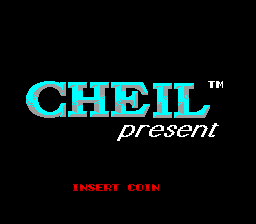 I hope in the future we can see them offered as a single package, and eventually merged, spawning the ‘classic’ builds (Arcade-only emulator without any of the pinballs, gambling stuff) alongside a complete build with everything (Arcade + Home) Some people remain unconvinced over this even if it is already the direction in which development is heading. Doing that would give a ‘best of both worlds’ scenario, with the main release showing our dedication as a team to the documentation and preservation of everything we can (a unified voice of what I hope UME shows right now, rather than it just coming from me) along with the Classic version for people who really don’t want some of the recent ‘bloat’ and prefer it to simply emulate arcade video games and nothing else. Everybody would win, I think? The Rise of the Robots proto made it in, so as I’ve mentioned, that’s if you like trainwrecks that’s no doubt one to study. Mahnattan for the Deco Cassette is there too, along with a couple of Deco Cassette bug fixes I made to support it. Grasspin too, in a working state even if there are a few things to be ironed out. From MESS the PV1000 has been promoted to working, a curiously underpowered system from Casio to which some not terrible ports were done, although the limitations of the hardware are quite apparent even from those. HLSL stability fixes have also been put in place, so it now copes better with games doing dynamic resolution changes, which previously were a very good reason to keep HLSL off altogether. If you like HLSL you won’t want to be using anything pre 148 because those fixes are essential for a significant number of popular drivers / systems. The vector games may still have issues, so you might want to create a vector.ini with HLSL turned off, although it has been said a more fancy HLSL vector renderer is in the pipeline, something I’m sure fans of AAE will be glad to hear. One of the other potential highlights is the Microvision support, also known as the ‘very first handheld’ Unfortunately it seems like nobody added any kind of Software List for it, which makes knowing what are valid images to run on it for testing rather tricky. I’ll probably revisit that one in one of the u updates if one gets added. The cartridges all contain only an MCU, which acts as the CPU, although with a resolution of only 16×16 monochrome pixels as you can guess it is going to be a very limited system! Once again proving the projects are an international effort and just not about the popular systems everybody knows there has been work on a number of relatively obscure systems including the Hanimex PENCIL II, a system mostly known in Australia (although apparently manufactured in Hong Kong) It’s more or less an MSX style machine, although again there is no software listed and it apparently does not have the capability to load in any software at the moment (it was placed in the wrong section of the messnew, it isn’t actually marked as working yet) Still, it’s one to watch if some dumps turn up, otherwise you can play with the built in basic. I’ve been holding off doing an update on this one for a couple of days because there are still a few issues to iron out, however the visuals seem OK now even if I remain unconvinced over the implementation. Anyway, on to the update. Italy has been a treasure chest for rare PCBs turning up for a while now and what we have here is another one. Still on a high from finding Planet Probe, the duo of Alberto Grego and ‘Zabanitu’ found what they thought was a regular Jaleco ‘Saturn’ PCB, however on booting it they found out it was something much, much more interesting. 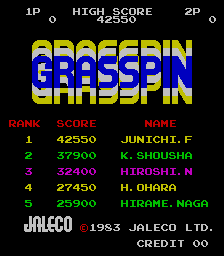 What they actually found they were in possession of was a game called ‘Grasspin’ running on the same hardware, a game which there is apparently no record of in Japan, or anywhere else for that matter, a piece of history completely forgotten until that moment in time. Now, there are likely several reasons why there are no traces of the game in the history books. The most likely of those reasons is that it’s a prototype, an unreleased game, something which failed it’s location test and was shelved; although you still hear about many of those and we have screenshots from plenty of long-lost games falling into that category so that alone really isn’t reason enough alone for it to be completely unheard of. 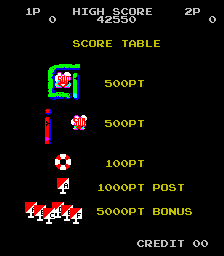 Now, assuming those credits aren’t just a leftover it would strongly indicate that that game was also developed by Zilec (and the main character sprite reminds me a lot of Blue Print) The default high score table does throw some doubt on this because the names all appear to be Jaleco staff rather than Zilec staff, but it is rather traditional for this to be the case. Anyway, if we go on the logic that the game was developed in the UK, and tested in Italy it’s possibly it never even reached the Japanese shores at all, despite Jaleco’s involvement. That doesn’t explain why nobody remembers it here, but we’ve never been as thorough with record keeping it would seem whereas the Japanese even have high score lists for games many consider to have never been released! As mentioned at the start, there are a few peculiarities with the emulation, first off there seems to be a minor comms issue between the two CPUs (the existing hookup for Blue Print / Saturn is apparently wrong) this causes you to always have infinite lives, because it thinks that dipswitch is always on (the dipswitches are read via the AY sound chip on the sub-cpu side then passed to the main CPU) It also seems to access video ram in a rather unusual way, often writing the upper tile attribute bits to the line after they’re needed, but a dump of the video RAM from the PCB seems to show everything in the right place. For the first reason the game is still tagged as NOT WORKING, although it is playable. The game, it’s an a decent concept, but not really too well implemented and probably shows the weakness of the hardware a little too much. 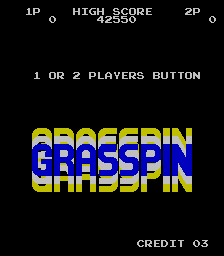 The whole thing centers on the novelty of being able to ‘spin’ the grass (the lines which make up the maze) by pressing a button, so yes, while the name ‘Grasspin’ may seem like a nonsensical word at first it’s simply a pun on the core game concept. Every rotatable piece of the maze rotates at the same time, so you have to carefully plan when you flip based on your position, the enemy position and where things will be as well as which paths are open after you rotate. That’s where the flaws start to appear, the biggest issue is that it’s not always obvious where anything is going to end up. 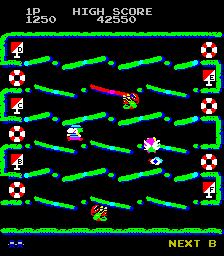 Every rotatable piece has arrows on it showing the direction of rotation which should in theory help, but in reality if you get pushed or not doesn’t always feel obvious and the whole rotation effect is done with an absolute minimal number of frames of animation (due to hardware limits) so the visual effect isn’t very good and quite often you end up pushing yourself into an enemy or an enemy into you or ending up on completely the opposite side of a barrier than you expected after feeling you you transported through it rather than being pushed. The frustration continues because the red grass near the top of the maze will push you further, and kill you and/or any enemies that happen to be standing in the way when you rotate it… sometimes.. and that’s the problem again it’s never really obvious if it’s safe or not. I’m sure if you played the game enough you’d get used to it, but that feels more like learning your way around the flaws of the game than playing it. Now inevitably there will be times when you get trapped, and on some lines of the maze are little life rafts, if you grab one of these and continue walking you’ll float down a river to the bottom of the playfield as an emergency escape, be warned tho, turn around for a second and you’ll lose the life raft, at which point jumping in the water is fatal, another odd design choice. 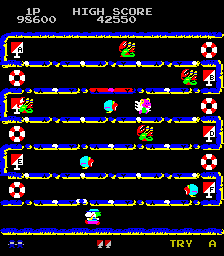 Not to mention that the bottom of the playfield isn’t always safe and you can end up with just as many enemies congregating there making the whole escapade pointless. 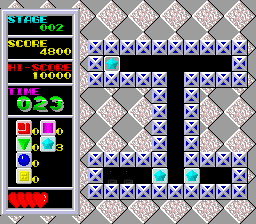 In all this I’ve failed to mention what you actually need to do to finish a level. 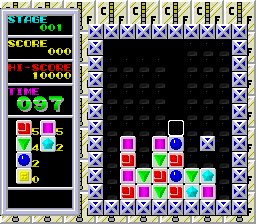 It’s actually rather simple, down the sides of the level are 6 flags, marked A-F, collect them all and you move on to the next level, collect them all in order and you get a bonus. 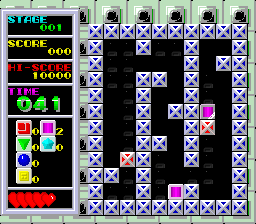 The various bugs are what make this game look prototype-like and there’s another one when entering the areas containing the flags; if you flip the maze while entering you’ll momentarily start walking straight through the outer wall until the game realizes something bad is happening and moves you back. Most enemies abide by the movement allowed by the maze pattern, but one of the cheaper enemies is a little Cupid / Angel thing floating around, slowly moving in diagonals and homing in on you, quite often you’ll end up trapped waiting for enemies to move, and dying because this thing gets to you before you have an escape route. 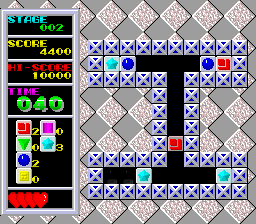 Later levels / harder difficulties also add some kind of ball which just spawns somewhere near you, bounces towards you and kills you if you stand around without moving for too long, very cheap. 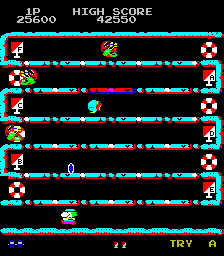 Level progression is almost non-existent, the mazes don’t change at all, just palette swap, and enemies become greater in number and speed as you go through the levels. 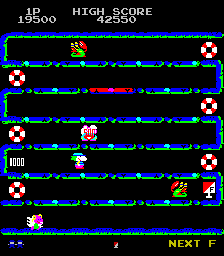 In that sense it’s no different to a lot of classic games, but it doesn’t feel very rewarding because the game just starts to feel very cheap after a few levels, especially when as I’ve mentioned at the start it can be quite hard to judge where you’ll end up at times. The sound / music is pretty decent for a game of the period, although without doing a video it’s not something you can grasp from the screenshots alone, and I don’t want to do a video until the remaining issue with the dipswitches has been ironed out. 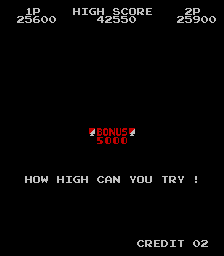 I’ve no idea what the game-over / high-score sequence is like because as mentioned earlier you currently have infinite lives. The game was definitely never destined to be a classic, although I’d say it was memorable so it does surprise that nobody seems to remember it at all, not even in location test form, but that’s just the way things are sometimes.